Look at the image above. 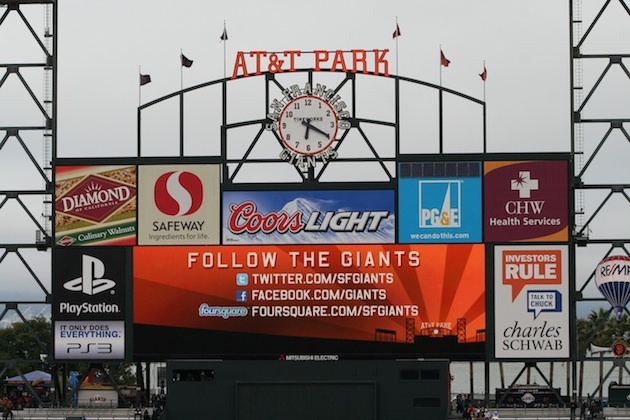 There are three services listed on the San Francisco Giants’ scoreboard during a baseball game. Twitter. Facebook. Foursquare. The first two are ubiquitous. Each has hundreds of millions of users and a firm place in pop culture. The third has about 2.5 million users. And much of the world has no idea what it is. But is it on its way to entering that pantheon of great services? This is a particularly interesting question given that on Wednesday, Facebook is expected to unveil its initial push into the location space. Earlier, BoomTown cited sources stating this would be the case. We’ve since heard from multiple sources as well that location will be at least a part of Facebook’s event (which we’ll obviously be at). With location, Facebook has long been seen as the 800-pound gorilla in the room. And now they appear ready to check-in for the first time, as it were. But just as with their status updates, many people may populate that with location data via third-party services (again, like Foursquare). That’s not to say Facebook won’t be competing with Foursquare at all. My guess is that a big part of their location play is involving places — that is, real world venues that they can get on Facebook in a major way. As we first reported back in June, Facebook likely has a deal in place with Localeze to build out a massive place database that they’ll then populate with all this data they’re federating and creating on their own. The potential problem for Foursquare here is if Facebook decides they want to be the ones that partner with all these venues on loyalty deals and programs. Obviously, that would be a problem for just about every location player as this is how most of them are working on monetizing their products. It would also likely be a problem for Yelp. And even Google, increasingly. That said, Facebook could also choose to promote a service like Foursquare as their check-in partner. The two sides were talking a few months ago when Foursquare was trying to decide whether to sell or raise more money. And while the idea of an acquisition kept coming up, so did other partnership ideas, we hear. Of course, Facebook could also go with Foursquare rival Gowalla for such a deal. After all, the company behind Gowalla, AlamoFire (they’ve since become just Gowalla), got their start doing Facebook games. 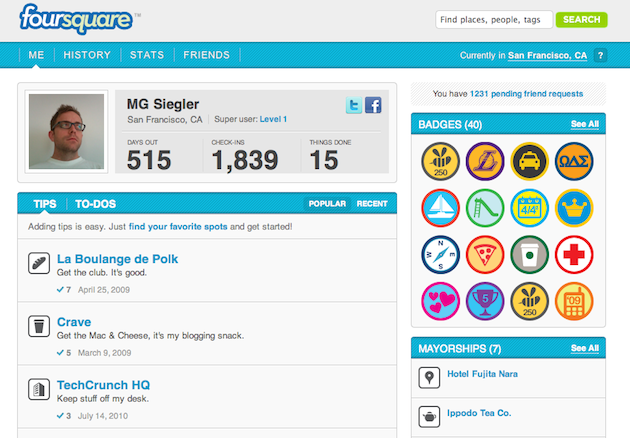 And early on, many Facebook employees were known to be active Gowalla users rather than Foursquare users. They’re also still undoubtedly on the acquisition radar as Facebook continues to scoop up talent, such as the Hot Potato team. Anyway, back to Foursquare. Assuming Facebook doesn’t kill them (which again, isn’t likely to happen), do they have the momentum now to keep growing and rightfully stand alongside Facebook and Twitter? I already know that all the commenters are going to scream “NO” but let me tell you what I think. I remember very well when it seemed like just about everything I read on the Internet said that Twitter was the dumbest service ever imagined and it would never go anywhere. I disagreed from day one. I didn’t know exactly what Twitter would be useful for. But I knew something was there. Believe it or not, the same was once true of Facebook too. People were already on MySpace, so they couldn’t figure out why they would want to use the boring, more closed version: Facebook. Again, I disagreed. There was something there. That combination of things would probably keep me using it indefinitely. The problem is that those things likely won’t keep the rest of my social circle using it. And that’s the glue that holds any of these apps together — the social graph. So Foursquare needs to come up with something else to keep those people using it. I’ve been hearing talk about people getting sick of using Foursquare for some time now. But in recent weeks the talk has gotten louder. 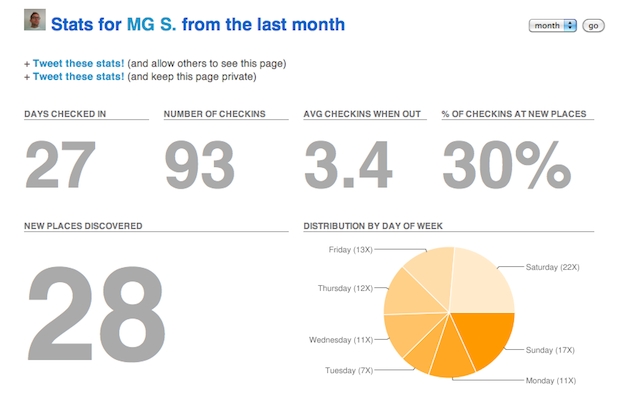 It’s not the same check-in fatigue issue that I wrote about several months ago. Instead, it’s a more focused check-in fatigue because many of them just don’t see the point of constantly checking-in place after place — especially if they frequent the same places. Sure, there are check-in deals and mayor deals, but most people I know (many of whom are heavy Foursquare users) never use those deals. The problem is that there simply aren’t enough of them. 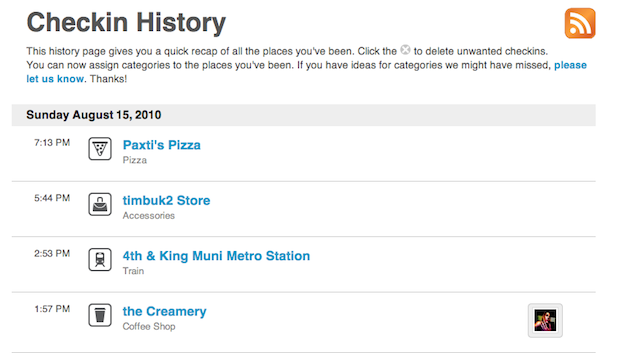 And the best ones are mayor deals which are basically impossible to get in a big Foursquare city like San Francisco. So instead, everyone is simply checking-in because that’s what their friends are doing. That’s a precarious position. Any number of things could stop that. And a chain reaction would occur. Simply put: Foursquare needs to change their game and needs to do it soon if they want to keep the momentum alive — if they want to reach the pantheon. They obviously know that, and are working on it. And it sounds like they have some of the right ideas. At least part of the upcoming Foursquare 2.0 is said to be about “choosing your own adventure.” And Foursquare has talked about making the service easier to use by doing things like checking you in if you swipe a loyalty card at a store. That’s a genius idea. That’s also probably the idea that is a viable business model for Foursquare in the long run. It’s something that may subsidize the whole social location aspect of the service. But for right now, that social layer is all that matters. They need to keep users engaged or they run the risk of becoming the Friendster of location. They’re coasting right now because most of the users are still new to the service and don’t have any fatigue just yet. But they’ll get there unless Foursquare keeps things interesting. Photos and comments in the stream couldn’t hurt (yes, like Gowalla). And neither could the ability to “like” check-ins. And a completely reworked point system would be good — maybe more closely tied to just your social graph. And one can never have too many badges. Foursquare is still a very young company. The fact that they were able to secure so many deals with huge brand names early on has perhaps elevated them a bit prematurely. Twitter and Facebook have proven themselves to be indispensable. With Foursquare, there’s still just something there.